Experience all-day comfort while toting a firearm and ammo with the Ergo Pack from Voodoo Tactical. The new, ergonomic design features an adjustable shoulder strap with movable pads for a customized fit. Alternatively, employ the hidden waist belt for greater security. 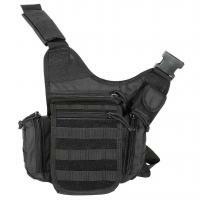 The tactical pack incorporates an ambidextrous holster with an attached elastic mag pouch for user convenience. Loaded with pockets, organized carry of all shooting gear is effortless. Ergo's exterior includes a rear, padded pocket that holds most clip sizes and two zippered side pouches with universal webbing to attach additional pouches. Easily-accessed pockets are built specially for cell phones and pens. Beneath the front flap zippered pocket greater storage decompartmentalization is unveiled. Under the flap, the pack houses an open pocket with a hook-and-loop closure for IDs, a zippered pouch with room for two additional pistol mags and a main central compartment closed with a cord-lock drawstring that protects against the elements.